NASA's next Mars rover may not launch for two more years, but that has not stopped the space agency from getting the vote out to name its new Mars Science Laboratory robotic explorer. Individuals can go online to rank by preference the nine finalist names submitted by U.S. students in primary and secondary school, including Adventure, Amelia, Curiosity, Journey, Perception, Pursuit, Sunrise, Vision and Wonder. The naming poll will remain open from March 23-29. Results of the poll at the NASA site (see link at bottom of story) will be announced in late April or early May. Can't wait? Vote in our unofficial LiveScience/SPACE.com poll now and see which name our readers prefer. The Mars Science Laboratory (MSL) mission was originally slated to land on the red planet this year, but has been delayed until 2011. 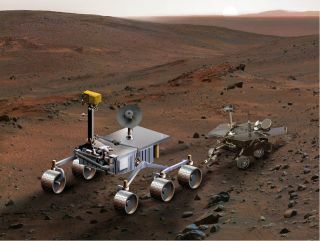 The rover carries a complex suite of instruments that can examine the Martian surface for traces of life, with onboard chemistry labs and a laser that can zap rocks to sample their composition. The SUV-sized MSL will dwarf current Mars rovers such as Spirit and Opportunity. Those rovers, named by a 9-year-old who wrote a winning essay for NASA's earlier naming contest, have remained up and running despite occasional setbacks for more than five years. Unlike NASA's recent voting contest for its new space station module, no write-in option exists for naming the Mars rover. The space station contest involved colorful name submissions such as "Xenu," a reference to Scientology's teachings, and "Colbert," named after the eponymous host of Comedy Central's "The Colbert Report." NASA has stated that its online contests are non-binding opportunities for the public to weigh in on naming its space hardware. More than 9,000 students from kindergarten through 12th grade submitted essays for the MSL rover in a nationwide naming contest that ended Jan. 25. NASA will select and announce a winning name in April, and allow the student who submitted the winning name to sign the rover. "The names that students proposed range from heroes to animals and bugs," said Michelle Viotti, manager of the Mars Public Engagement program at NASA's Jet Propulsion Laboratory in Pasadena, Calif. "No matter what name is finally chosen, this is a mission for everyone, and we can't wait to start calling this rover by name." Several new features exist on the Mars rover naming contest site, including a world map showing where votes have come from. Individuals may also fill out some brief information to include their name on a microchip that MSL will eventually take to Mars in 2011. Click here to cast your official vote at NASA's MSL Web site through March 29.